These babies are officially mine! So excited at this purchase. Went to Oxford St with Rosie today, dying to go into Topshop to buy a lip stick in coy/powder room. After swatching them i was disappointed, although beautiful and pigmented the colours were more vibrant in person, and not colours I would dare to wear. Moving downstairs to the petite section (the main reason why I love Topshop) I found these. Gorgeous, bleached denim hotpants with intentional signs of wear...ticks every box. At £28 they're the most I've ever spent on an item of clothing, but I'm very happy with them! They are as short in person as they appear on the website, though that's nothing a pair of tights underneath can't sort. I think they're so versatile and stylish, and I'm looking forward to wearing these loads! 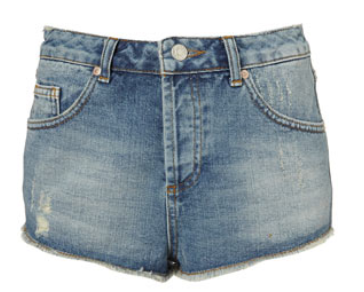 Have you tried out Topshop's denim shorts before? What did you think of them? A gorgeous pair of babies!